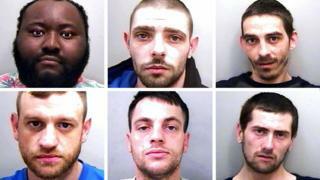 Six members of a drug gang involved in a so-called “county lines” operation dealing heroin and crack cocaine have been jailed. The men supplied the drugs from five addresses in Grimsby between October 2015 and October 2016. A man and a woman, who were also involved in the operation, absconded from Hull Crown Court on Friday and are being hunted by police. All pleaded guilty to conspiracy to supply Class A drugs. The gang, from Manchester and one from Louth, Lincolnshire, ran the drugs plot from addresses in Hainton Avenue, Thorgam Court, Farebrother Street, Freeman Street, Sussex Street, and St Augustine Avenue. The court heard 1.4kg of Class A drugs were recovered. Sentencing the gang, Judge Mark Bury told them: “All of you were motivated by money. “This operation was reasonably sophisticated. He said siblings Billy, 28, and 25-year-old Lauren Griffin would also face custodial sentences, which he was “going to increase due to them not appearing in court”. County lines is the name given to urban drug dealers expanding their activities into smaller towns and rural areas, primarily to supply crack cocaine and heroin to addicts in those locations. According to the National Crime Agency there are currently more than 1,500 lines in operation in the UK. Det Sgt Steve Elliott, of Humberside Police, said: “This has been a complex investigation, over a long period of time, which dealt with very serious offences.